Okay then. I’m going to have to get a KitchenAid. That looks absolutely beautiful- makes me miss Paris even more! I don’t have a KitchenAid right now but will be in a few weeks. Maybe this will be the first recipe to try! My to-do list now includes your recipe for brioche! Another tip on procuring a KitchenAid stand mixer — try amazon.com and search for refurbished or reconditioned units. They are typically less than half the cost of a new one and still carry a 6 month manufacturer warranty. The availability of mixer models changes weekly, so check in with them often. Also, Amazon always seems to have a $25 off coupon for Kitchen & Housewares, so be sure to look for it.I may sound like a shill for Amazon, but I promise I’m not. I just always seem to find bargains in their outlet sections. I got my refurbished 6-quart KitchenAid (after 20 happy years with a 5-quart) from KitchenAid’s own retail store (and shipping was free! ): http://www.shopkitchenaid.com/product_list.asp?SKW=KTAFACTSTAND&HDR=outletThey take apart and rebuild the refurbished models from the ground up, even repainting if necessary. You might as well be getting a brand-new machine. I couldn’t love mine more.In his wonderful blog, David Lebovitz tells of touring the KitchenAid factory and what amazing bargains are to be had in the retail store:http://www.davidlebovitz.com/archives/2006/04/#000232The only advice I would add is to go no smaller than a 5-quart model, get as much power as you can (heavy-duty or pro version), and don’t bother with the tilt-head models– bowl-lift is the way to go. Wow! Looks delicious! And I, for one, cannot live without my KA mixer. Actually, I got a larger capacity one this spring and it is most awesome! That brioche looks like it would melt in your mouth like cotton candy. I can’t believe you had the patience to stick with it, but look at the results! It sort of makes me feel bad that my Kitchen Aid (Delonghi, actually) is sitting on my countertop gathering dust. Yaaaaay! You got a KitchenAid! Knowing how you have searched, my dear, I am SO happy for you. Whooooooop! 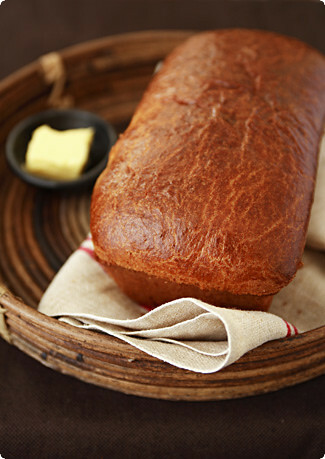 And the brioche looks just heavenly – especially with that vanilla bean browned butter. Genius, my friend. I really love your step by step especially for bying the kitchen aid , hopefully I’ve got one and my brioche is really good too ! The difference with your is that I use the ingredients cold very cold and not at the room temperature, and it’s always a success ….Hope you’ll try once ! and tell me the result!I have spent a great moment reading your post ! So funny! I am glad you triumphed in the end, and glad that you and your Kitchen Aid are having fun together–replacement cap and all. Congrats on a smart buy, and on some seriously gorgeous bread. Great post Melissa! What hardship you had to go through – but I guess it was all worth it in the end, huh? It looks really WOW! Your first step is the key: in order to persevere with anything challenging (but ultimately rewarding) you must establish that deep, emotional connection. Otherwise, why continue? Congrats on the Kitchenaid, Melissa. I do not think I would want to imagine a world without mine. And the brioche, absolutely lovely! The texture looks perfect. I have completed step one, and have a beloved Kitchenaid in British Racing Green. As soon as the weather cools down a bit, I’m ready to go. I’ve been thinking about this for a while now, and you have officially pushed me over the cliff. Lovely post. Wonderful recipe and post, thanks so much. I recently had a party and made gorgeous strawberry sandwiches using mini-brioche from a fantastic bakery in New York…had the timing of this post been a month earlier, I definitely would have used your recipe and followed your sage advice. Ok, you´ve officially scared me now. I am terrified of e-bay, of brioche, of butter…But I will try it. I will. I don´t have a Kitchen aid. It´s my bajor object of desire, but the Thermomix will have to do for now. Sigh. You have to explain to me how it is possible that you haven’t been offered millions of dollars on a book deal! Your writing is so unspeakably fantastic, not to mention the glorious photography. I completely envy your persistance with the brioche, but it sounds like it was worth it! Wow. You nailed it, every single beautiful step, including the purchase of the KitchenAid and the necessity of failing on the first try. (My own failed brioche was from a 19th-century cookbook, Miss Parloa’s Kitchen Companion by Maria Parloa, whose recipes are nearly foolproof, but whose brioche recipe rendered a loaf that was tough, crumbly and just plain weird. I then turned to Sherry Yard and never looked back (although Peter Reinhart has some pretty fine brioche recipes, too).Browned butter, though? That is a genius idea. You, dear Melissa, are a genius. Did I mention you are a genius? Wonderful post.Thanks for the tips.My KitcheAid died on me many moons ago but I think I could still make this. Beautiful post and beautiful brioche! I definitely have step #1 taken care of. My favorite day is saturday soley because we make brioche at work. I eat it there, I take some home, I make french toast out of it for breakfast the next day. Yes, brioche and I are very much in love. hi melissa, you know what really blows my mind about this post ? – aside from the terrific writing, trustworthy recipe, and fabulous pictures of course, things your ardent fans have come to expect whenever they visit 😉 the fact that every single time you’ve previously posted about some divine baked goods, you did so without the aid of a heavy duty stand mixer. if that isn’t telling of your skill and passion, i don’t know what is! If only I could make it to your place in 7 steps to enjoy this brioche! Sounds like a big job, but well worth it I’m sure. A KitchenAid? There’s the rub.Besides the lack of patience. Lovely read though.BTW , at the risk of being called a dope, what ELSE does a KitchenAid do ?? Oh my! Now that’s a perfect brioche! Yum! Looks delicious! Maybe I’ll give it a try this weekend. This is one of the foods I’ve always wanted to make. If you really love brioche, take your loving hands, don’t trust the KitchenAid! For those who are desperate for a KitchenAid but either can’t find one on ebay, or can’t afford one even then, try the Kenwood Patissier. It does pretty much everything the KitchenAid does although you can’t add attachments. They go for about £50-60 new on ebay or for about £100 on amazon. Happy brioche-making. Thank-you for this amazing recipe. Definitely worth the time and calories. I just know that I’ll be making this again and again. Having no access to a KitchenAid mixer and no means to purchase one (I’m in a bit of a lurch with money as a unversity student right now) I thought there would be no reason not to try this recipe out by hand. It was SO easy! Definitely take out the PURCHASE KITCHENAID MIXER step in this recipe. It’s so much more rewarding (and easy!) making this brioche by hand. After eyeing this recipe for more than one and a half years, I finally took the plunge and – thanks to your detailed instructions – everything worked out beautifully. I’m in brioche heaven! Without you, I would never have accomplished this glorious taste and texture! 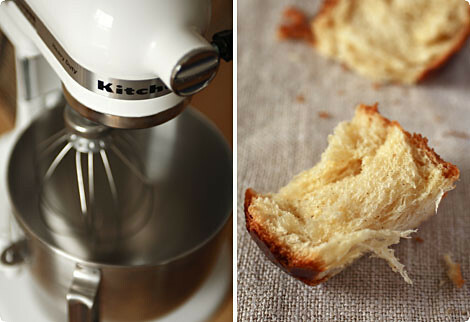 You don’t need a Kitchen-Aid mixer to make brioche. Time does the work in this recipe which takes at least 18 hours of elapsed time and minimum hands-on time. You’ll need a food processor with a capacity of 12cups or greater, and the metal chopping blade to make a lovely brioche, with very little effort. The main effort is spent scraping the dough out of the food processor and cleaning it.Food Processor BriocheDry ingredients- 550gm all purpose flour- 1/2 tsp salt- 1/4 tsp instant yeast- 70gm sugarliquid ingredients- 1/2 cup of cold buttermilk- 1/2 cup of cold milk- 4 cold eggsButter- 225gm butter cut into 1/2 inch chunks, additional butter for the bowl. You can use beurre noisette (brown butter) for a more complex flavor.Butter a large, ceramic bowl for the dough.If it is particularly warm, then chill the bowl in the freezer for at least 30 minutes before starting.In a 12 cup food processor, combine all the dry ingredients and mix until well distributed. Take the liquid ingredients and combine in a bowl until well mixed. Add the liquid ingredients to the dry ingredients in the food processor and pulse until well incorporated. The dough will be very thick and liquid. Scatter the butter over the dough and pulse on and off until incorporated. The machine may stall. If it does, remove some of the batter and process in two batches.Scrape the dough out of the food processor and into the prepared bowl, taking care to remove all the pieces. It will take you longer to this than it did to make the dough. Cover the bowl with plastic wrap. Let the dough sit at 68F overnight (about 8 -9 hours) for the first rise. If the bowl is just the right size, the dough will almost rise to the top. Place the dough in the refrigerator overnight or for at least 6 hours. It will rise just above the pan. You can then use form the dough into shapes, let them rise (2 hours for individual-sized brioches and 4hours for larger loaves. Bake them using the standard recipe. Brush the tops with an egg wash before baking and sprinkle course sugar over them/ I bake them at 450F. Formed into standard-size loaves, they bake for 45 minutes, individual brioche take 20minutes. The exterior will be heavily burnished. When using black tins, reduce the heat to 425F or bake for 17 minutes at 450F. I made this recipe past weekend it the brioche came out just perfect. Glorious! Thank you so much for such detailed instructions. My KitchenAid mixer didn't overheat at all, it was a little warm at the end, but nothing terrible.